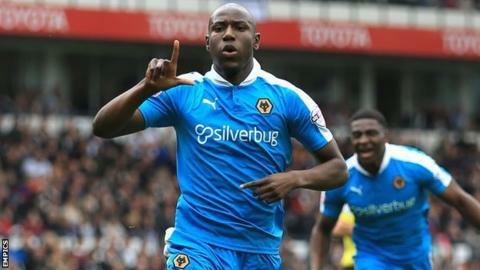 Benik Afobe is hurt by claims from Wolves that he was not trying during his final five months at the club before his £9m move to Bournemouth. Speaking to fans on Wednesday, Wolves head of football development and recruitment Kevin Thelwell said: "Benik was no longer trying to play for us. "That was undermining everything we were trying to achieve." But striker Afobe, 22, responded on Twitter: "I wasn't going to comment but this is too shocking and very hurtful." Afobe, who was the subject of bids from Norwich in August, scored 10 times in 27 appearances for Wolves in 2015-16 prior to joining the Cherries in January. That strike rate was down slightly on the 13 goals he netted in 21 Championship appearances following his move from Arsenal in January 2015. "I did my best," added Afobe, who turns 23 on Friday. "It was hard for us all. I asked to leave but only because I wanted to play in the Premier League, but I never told my team-mates or disrupted the changing room." Wolves chief executive Jez Moxey told BBC WM: "He insisted on moving. We were forced into doing a deal that we didn't want to do. "We had said publicly that Benik would not be sold this season. It was a statement of intent and the owner [Steve Morgan] backed us completely." Afobe has since scored three times in five starts since joining the Cherries, but failed to find the net when he appeared against his first club Arsenal on Saturday. Wolves head coach Kenny Jackett played a straight bat at Wolves' pre-match press conference on Thursday, ahead of Saturday's home game with Preston. "Benik had a whirlwind year with us," he told BBC WM. "People saw the games. People can make up their own minds." Jez Moxey and Kevin Thelwell spoke to BBC WM prior to the club's latest Fans' Parliament at Molineux.